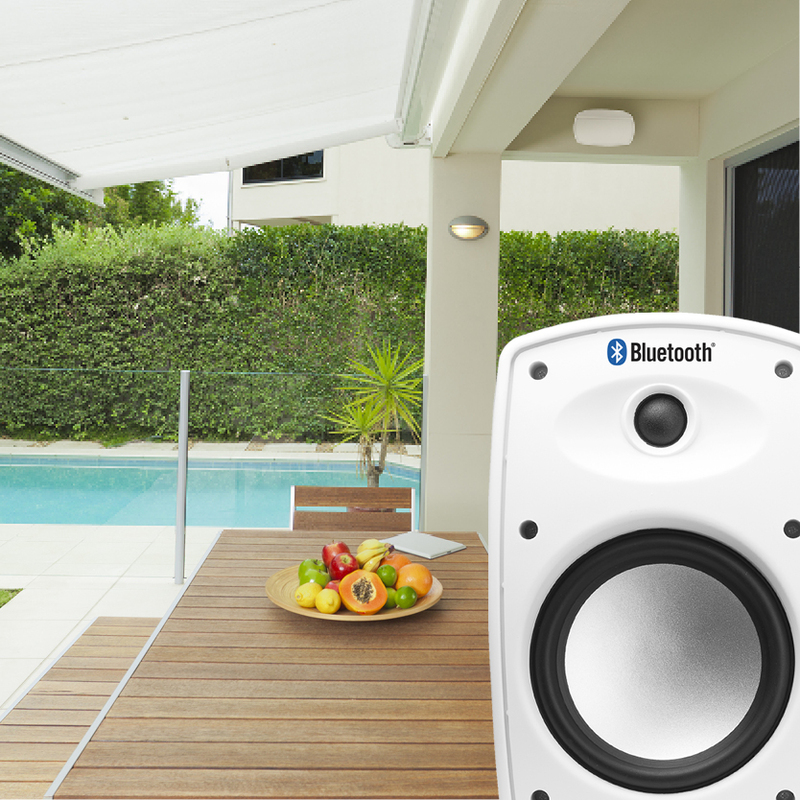 BTP-525 Water-Resistant Wireless Bluetooth® Patio Speakers from Outdoor Speaker Depot are smart buys for patios, decks and pool areas. They're ideal for use indoors and outdoors, and they're available in black or white so you can create the perfect look for your sound system. 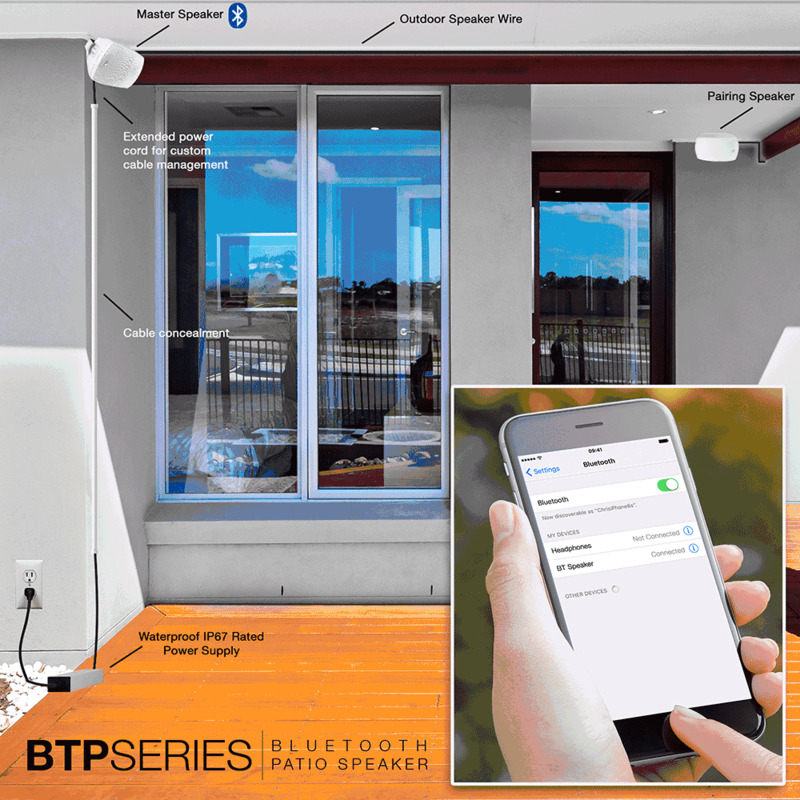 These Bluetooth® patio speakers feature a single connection for a Bluetooth®-enabled device, and the pair includes a 25-foot AC power supply (please see diagram in above photos). These speakers also come with 10ft of speaker wire so you can place them on opposite ends of your space. 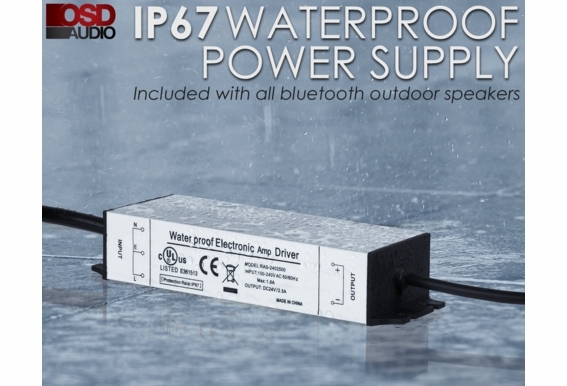 We also add innovative weather resistant cap to better protect the speaker connection. 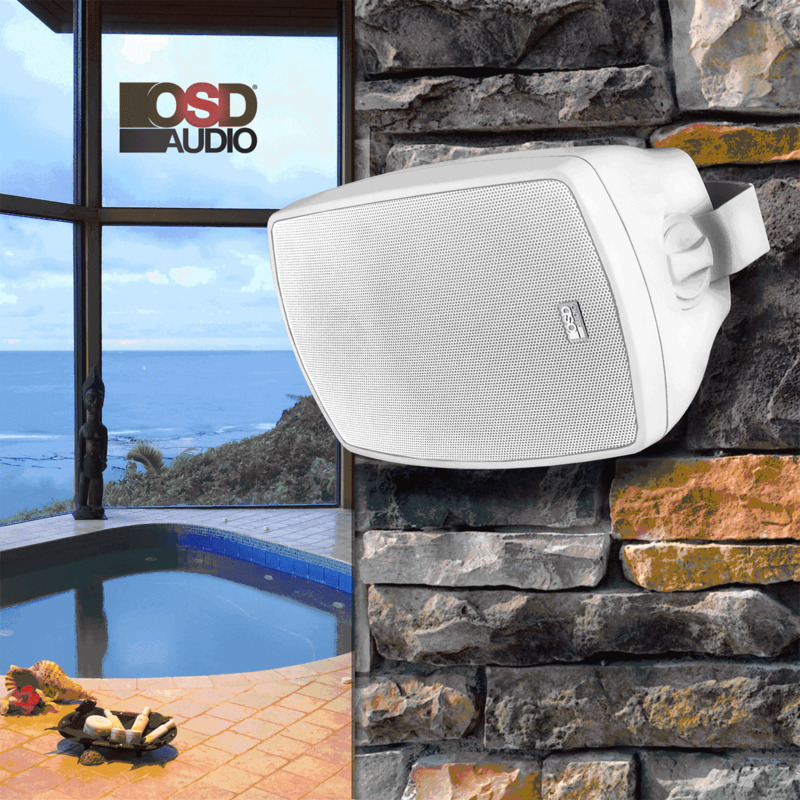 These two-way 5.25-inch indoor/outdoor patio speakers each have a 5.25-inch treated paper cone woofer with butyl rubber surround and 0.5-inch PEI dome tweeter. 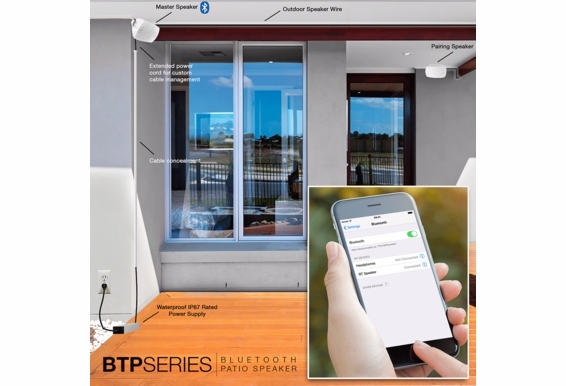 The Bluetooth® range is 50 to 75 feet for an obstructed line of sight. 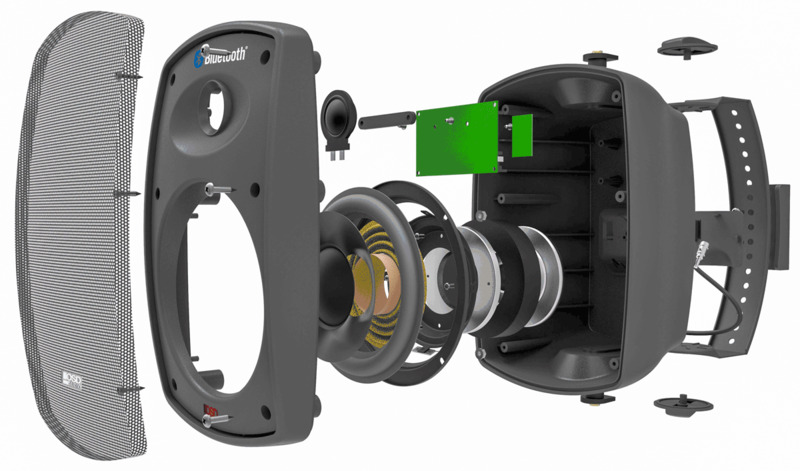 Each speaker is 9 inches by 7 inches with a 6-inch depth. Plug to Transformer - 3' 9"
Transformer to Speaker - 16' 5"
3) The Pairing speaker must be connected to the Master Speaker with the 10-foot Speaker Cable that is supplied with the kit. 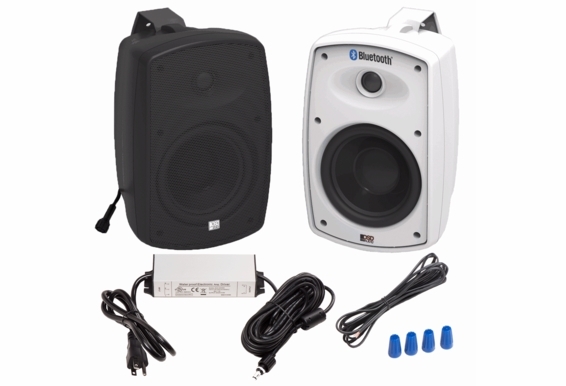 I have a bluetooth computer, buying these speakers do I need anything moret music from Pandora or similar. Can I buy extra mounting brackets ? I want to be able to place them different places as weather changes. Is it possible to extend the low voltage cable (between power supply and speaker) to 120 feet? 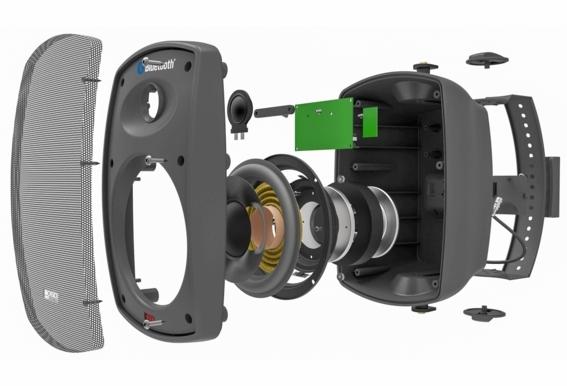 Hi, Do you sell additional passive speakers which I can split the wiring coming from the powered one? Will these speakers work with a Bluetooth transmitter plugged into my receiver headphone jack? My A/V receiver can receive Bluetooth but does not transmit. Hey OSD...How is the non-master speaker powered (if the master is the only one of the pair that is powered)? Just have to note, I purchased all of my in-ceiling speakers, in-wall volume controls, and a speaker selector (after a whole-house renovation) from OSD and I am very pleased with both the cost and quality! Thank you OSD! I want to be able to play sound through the tv and switch over to Bluetooth and play music from my phone. Is this possible with these speakers? Are these speakers weather proof? 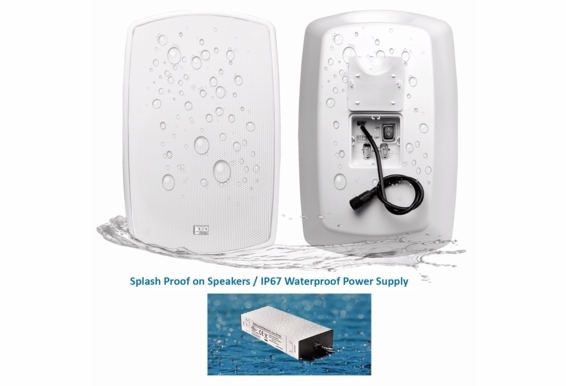 We live in New England and therefore have various unexpected weather conditions.. can these speakers withstand these conditions, or do they need to be brought in and out every time we use them? Does this connect with Alexa??? Are the speakers Yamaha MusicCast compatible ? I.e I know they will work with my receivers Bluetooth function but will they be recognized as a MusicCast device? There is a difference. I need two sets of speakers (total of four) on my patio. Can I purchase a SECOND set BTP525 and discover AND connect both sets for simultaneous play? I was looking at the BTP-525 wireless Bluetooth speaker a bit confused it say's connection to master speaker should not exceed 13' but it also said pairing speaker must be connected to the master speaker with the 30' of speaker that is supplied with kit ? How many speakers can be connected at one time? To one receiver? I purchased these 2 years ago and they've worked great. Recently however something must have happened and when I turn them on all I get is a clicking sound. I'm wondering if it's the power supply or the speakers. If it's the power supply do you sell a replacement power supply for these speakers? I've had a pair for just over a year. Suddenly the speakers will no longer sync with my phone. You can hear a slight hissing sound coming from speakers but anytime I try to re-sync them....no sound telling me they have paired. I've tried everything I can think to get them to work again but to know avail. Any thoughts? I purchased the BTP 525 and I believe the power adapter went out. The speakers are plugged in and they wont turn on anymore but they were working fine recently . Do you sell a replacement power source? How long is the power cord off of the master speaker? how do you adjust volume? 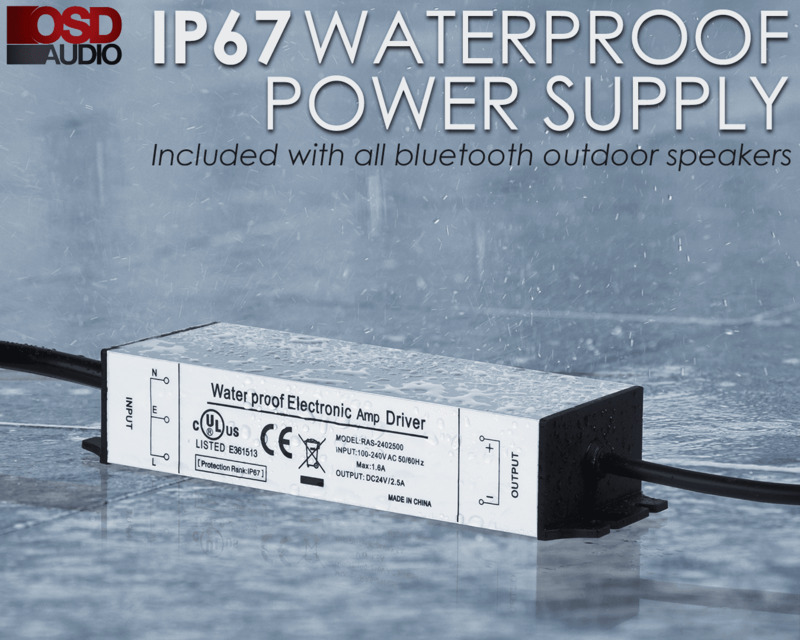 Lost the power supply and don't see it as available on this site. Please help OSD!! Anyone have issues with volume from a Mac book pro 2016? Works great on my Android devices with my Mac book the volume at .25 out of 10 is way too loud like my Android at 6. I've looked for a solution on the Mac to lower the volume with no like. Blue tooth is a digital signal so I find out strange that the volume is so much louder. My speakers no longer work after less than a year of use, the light on the adapter doesn't light up, is there a replacement adapter? The connector to the amp speaker is pretty specific. What is the voltage and current output of the Power Supply for the master speaker? I want to install this in an RV type trailer, and not be dependent upon 117VAC for power. Ideally the Power Supply would offer 12 VDC to the master speaker, at some reasonable amps... but if not, it may be easier for me to acquire a voltage converter... than provide 117VAC. Thank you. 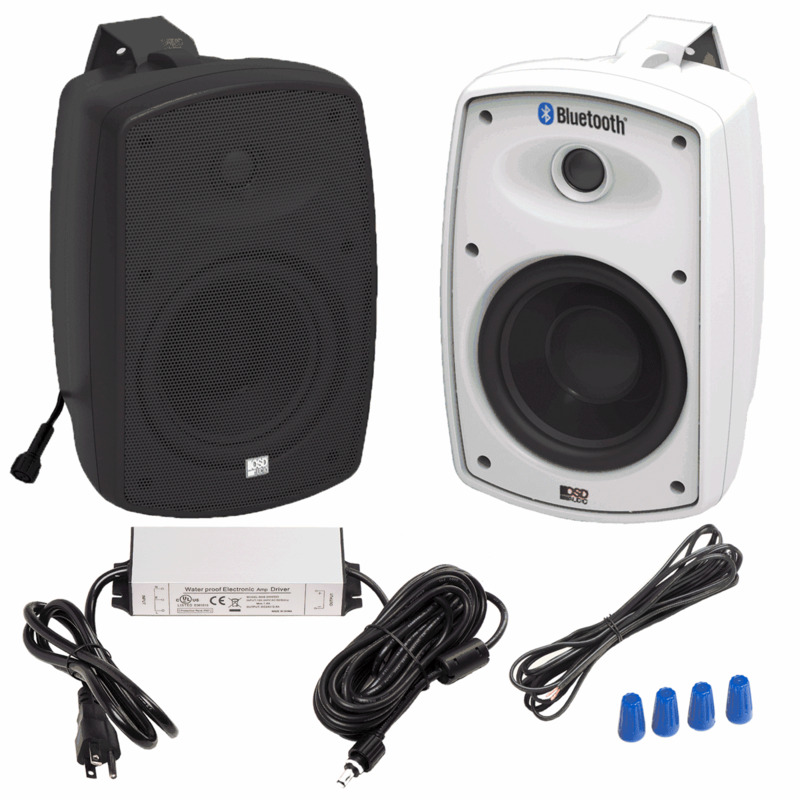 Can you connect these speakers to a receiver using speaker wire to uses them as regular speakers? Regarding the power cord, does it come in white? I need it to match the color of my porch. Also, is the power cord plug three-prong or two-prong? How long is the power supply cord which is plugged into the outlet? I have a OSD set and I need a new power cord. Can someone let me know where I can purchase one? Thank you. 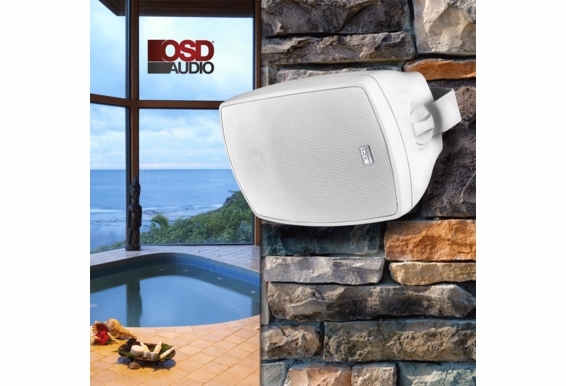 Can these speakers be mounted underneath the patio soffit and then angled as needed for best results? I have these and mine will not connect anymore I can hear them attempting to turn on, however there is nothing. I have unplugged and reconnected I have power and that's all. Can you please assist? Is the power cord 8 feet long....a post below says his was delivered with a 4 foot power cord. Does the bluetooth come with a pairing code so that it isn't free access to anyone without it? How do you turn the speakers on and off? I plan to mount these up high and out of reach and out of the weather. Is there a remote provided? Concerned how we will be able to turn these on and off once mounted. Please advise. Hi Does this have an Australian compatible power supply. 240V. Can I wire these speakers to the TV via the RCA sound output? If yes, will Bluetooth mode still works with an iPad or iPhone? Bought and mounted these on my deck. they sound great but I was surprised to find the power cord has a power supply that needs to be located in a dry location. 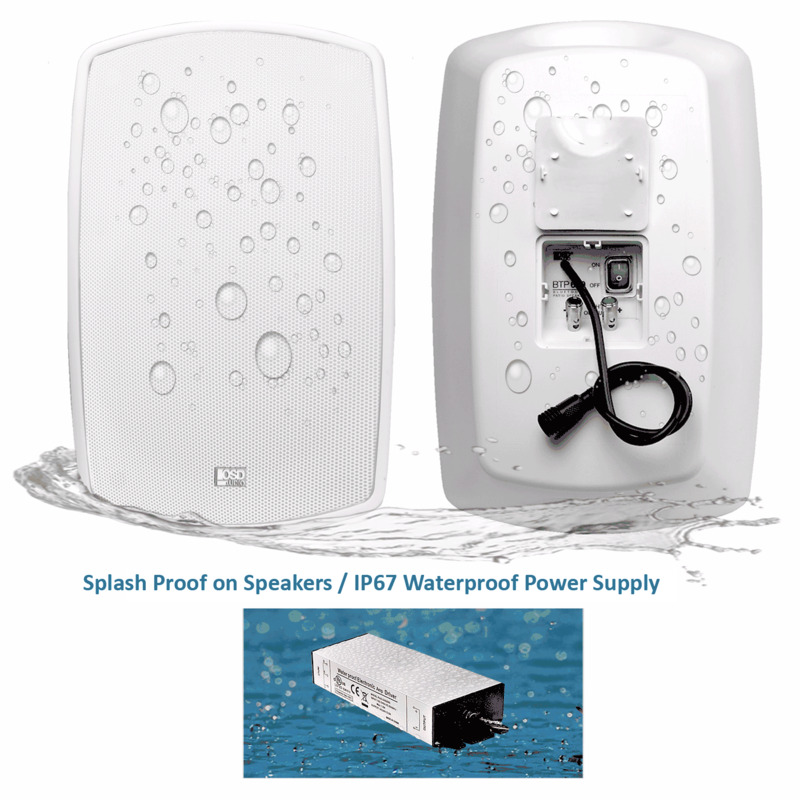 What recommendations do you have to keep this outdoor speaker power supply dry? Has anyone discovered a solution for hiding the power cord? I want to get these and have them mounted on my patio. But I worry about the eyesore of a dangling power cord that has to connect to an outlet near ground level. Where is the on/off switch? If I mount them on the wall flush is the switch accessible. Thanks in advance for a response. You said "It is recommended that the speakers be no more than 13 feet apart for proper stereo separation" . For my deck configuration i would like to place them about 40' apart. What issues could i have? can these be used with a source other than bluetooth? Can i plug a sonos connect into this for example? If not do you have another bluetooth speaker where i can at a later time also plug a different source into them? How water resistant are these? I live in Oregon. Am wondering if I need to take them down in the winter when we get lots and lots of rain? How do you control the volume of the speakers? 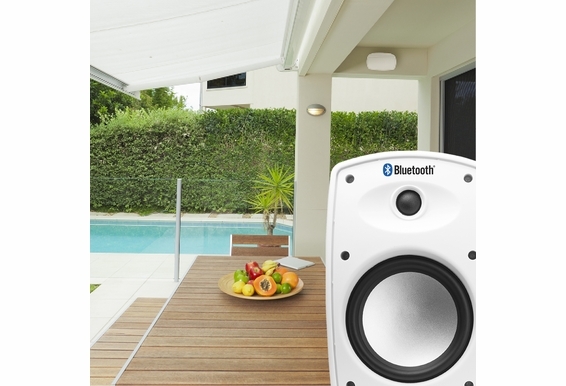 Do you have an approximate time schedule for the introduction of multiple outdoor speakers? 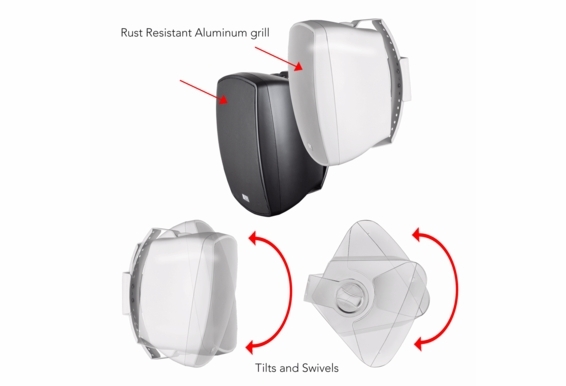 Do thee speakers come with the metal brackets to hang them as seen in the pictures? Can I buy two sets of these and connect one to the other? Can these be in moisture areas where they will get wet by rain? 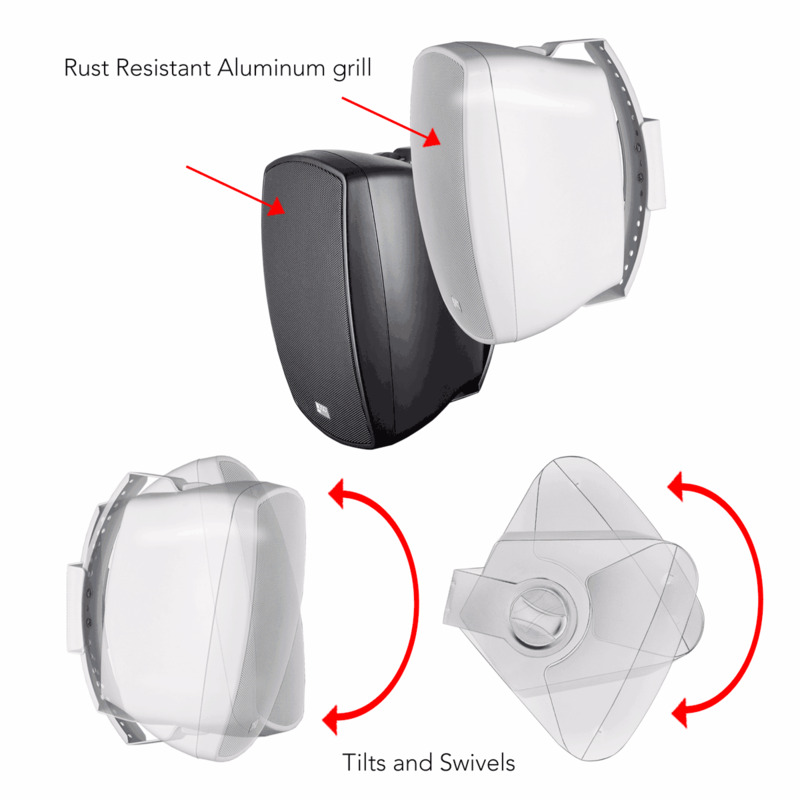 Hi Todd, It is best to have the patio style speakers mounted under cover (eave, patio) as they have metallic parts that can rust. The Bluetooth rock speakers can be out in the weather.